Pi Theta Mu members were the Mount's official "hostesses." THE HISTORIAN OF PI THETA MU, Connie Diwa, paid a visit to the Archives yesterday. Like other sororities, this venerable Mount institution is interested in rediscovering its history and reaching out to alumnae. Founded in the 1952-53 academic year as an honor society for graduating seniors, that's six decades' worth. Fortunately for the sorority, about 3 feet of shelf space in the archives is devoted to Pi Theta Mu's scrapbooks, so Connie and her sisters have lots of history to work with. In the first years of Pi Theta Mu's story, graduating seniors were elected to membership based on their service to the college and community during their four years at the Mount. In 1963, the charter was changed to a service organization for sophomores. 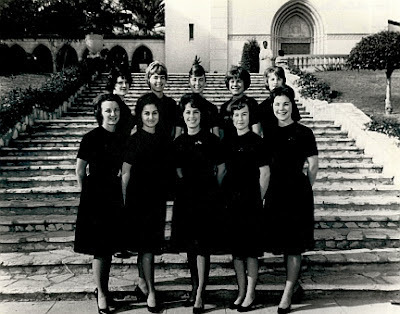 According to Sister Germaine McNeil's History of Mount St. Mary's College, Los Angeles, 1925-75, members were the "hostesses" of MSMC, "serving at luncheons, teas, and banquets, officiating at student body elections, and ushering at formal college events on and off campus." The PTMs are easy to spot in the historic photos -- they are all dressed alike, right down to their black pumps.